A 17th century wine-growing property, with more than 14 ha with AOC Buzet appellation, surrounded by 57 ha, between Bordeaux and Toulouse. 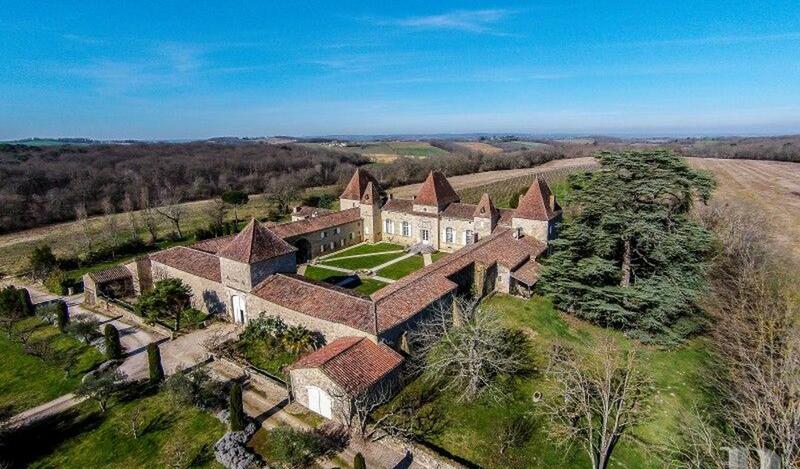 This chateau stands in the midst of the Albret region where the borders of the Landes and Gascony meet, an area renowned for its Buzet wines. Forming an enclosed and preserved property, it is near to the Bordeaux-Toulouse motorway, Agen TGV train station, with 190-minute links to Paris, and Agen airport, with its daily return flights to Orly. 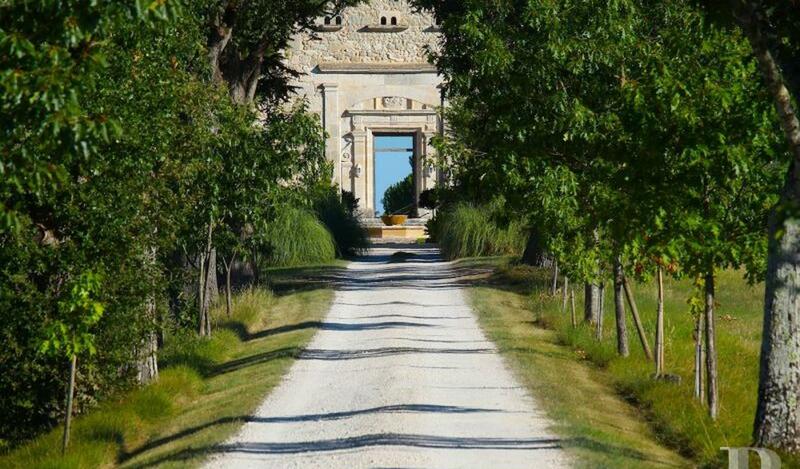 Beginning with a tree-lined driveway and the vineyard on either side, this property opens its arms and the chateau appears, constructed around its inner courtyard. It is accessed by passing under the dovecote-porch way, set in one of the wings. The diversity of the roofs and the treatment of the facades reflect the hierarchy of the various buildings. The main building, the stately north wing, is rectangular and divided by three pavilions, one in the middle and one at each end. Two pavilion towers flank the south facade. Double wooden doors in the centre have a dressed stone architrave featuring pilasters and a pediment bearing a coat-of-arms. The outline and profile bring that of one of the Loire chateaux to mind. The different roofs include pavilion roofs with flat tiles for the dovecote and the towers, hip roofs with flat tiles for the three pavilions and long-sloped roofs with Roman tiles for the rest of the buildings. Both the east and west wings also have central, vaulted porch ways providing access, via the west wing, to the swimming pool as well as the neighbouring holiday rental accommodation unit and to a garden via the east wing. On the north side, behind the immense terrace, vines are laid out in an almost romantic walk as far as a gazebo on the edge of the forest. The chateau and its wingsA stone porch way provides access to the entrance hall. A doorway adorned with a coat-of-arms opens into this large, through hall which leads to the reception rooms and opens, on the other side, on to the parklands and the vines. Flagstones cover the floor. The straight ceiling is centrally adorned with moulding, outlining a large oval. The walls, with their painted frescoes, reflect the countrified surroundings. A stone fountain enhances its Italian air. The hall marks the current division into two sections; one on the right-hand side used for accommodating guests and the other, on the left-hand side, used for private purposes. The walls in the large lounge are adorned with panelling. The floor is covered with strip pattern wooden flooring. Four large windows let in copious amounts of light. A straight, fruitwood fireplace is topped with a trumeau, featuring a Watteau style scene of gallantry. A door, on the left-hand side of the fireplace, opens into a 19th century lounge which is part of the holiday rental accommodation units. It features a mosaic floor and a tall, troubadour-style, wooden fireplace, with a coat-of arms carved on the chimney breast. A small kitchen on a higher level, reached via a few steps, has a window overlooking the inner courtyard. Two doors flank the lounge fireplace: one leads to a stairway going upstairs to a bedroom, with a dressing room and a bathroom. The top landing of the stairway provides access to the attic which spans the entire floor surface area of the main building and is predominantly insulated under the exposed roofing framework. The other door opens into a large bedroom at the end of the wing, in the pavilion. It adjoins a refined bathroom, combining the preserved rusticity of the construction materials with the quality of its fixtures and fittings.